Blaze is dead (sedated…with a captive bolt shot into her brain). Her two cubs have been shipped off to the Toledo Zoo for lifetime incarceration. It was the hiker–a man referred to by the media as “an experienced hiker”–who set this string of tragedies in motion by breaking cardinal rules for hiking in griz country: he hiked alone, off trail, without bear spray. In July of 2011, a grizzly sow with cubs killed a hiking tourist in Yellowstone (hiker error figured into this fatality, also; watch a computer-generated reenactment of that attack here), but that mom’s action was deemed strictly defensive–she immediately retreated–and her life spared. Some seven weeks later and eight miles away from the July fatality, a lone hiker was killed, partially consumed, and apparently cached. 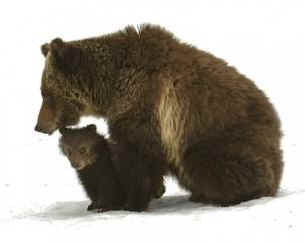 DNA testing revealed that the same bear was at least present at the scene; she was captured and killed, her cubs doomed to diminished lives in captivity (view a timeline of these events). Yellowstone personnel don’t want to kill bears–I believe this–they act as they believe they must to mitigate risk for the three-plus million visitors who flood into the park each year. It’s a good reminder that wildlife conservation–like all our other conflicted relationships with nonhuman animals–is premised on speciesism. Who are we to decree which animal behavior is natural (and acceptable) and which is unnatural (and unacceptable)? Because we are the humans–of course!